The Canary Islands is a gold mine of tourist attractions. Almost everywhere one goes, stunning vistas with rich history touches the soul. None can compare to Pozo de la Salud, though. The Well of Health is rare in the sense that there’s not much ‘well’ or waterhole tourist spots anywhere in the world. And both as it has more than three centuries of history and is surrounded by stellar sights. Built by human hands meant to quench thirst, it also did more than that. It healed, and word traveled fast. And now, it is one of El Hierro’s most visited places of interest. For centuries, the scarcity of water in El Hierro has limited its population. Not only that, but it also forced some to relocate elsewhere. Hence, the locals in the town of Sabinosa built a well between 1702 to 1704. The water that came from it was somewhat salty but drank it they did as it was worse than having none. In time, the people realized that those who drank from the well were in better health. Even then word traveled fast, so the miracle quickly spread like wildfire. By 1844, the Well of Sabinosa (as it was called then) was declared mineral-medicinal water. Pozo de la Salud’s fame rose even further when in 1945, a military engineer José Ángel Rodrigo-Vallabriga Brito started selling bottled water from the well to other islands. Soon, the water from the well reached other countries such as Cuba and Puerto Rico. There’s not a lot of people who can claim they look forward to seeing the water well. Perhaps travelers may think twice, or even thrice, about visiting one. Not the “Well of Health” though. It is one of El Hierro’s most visited sights, and the numbers are going up. The Pozo de la Salud is the symbol of Sabinosa, and tourists traveling here or around the area shouldn’t miss it. Aside from its rich history, the location of the well also serves as a fantastic viewpoint. 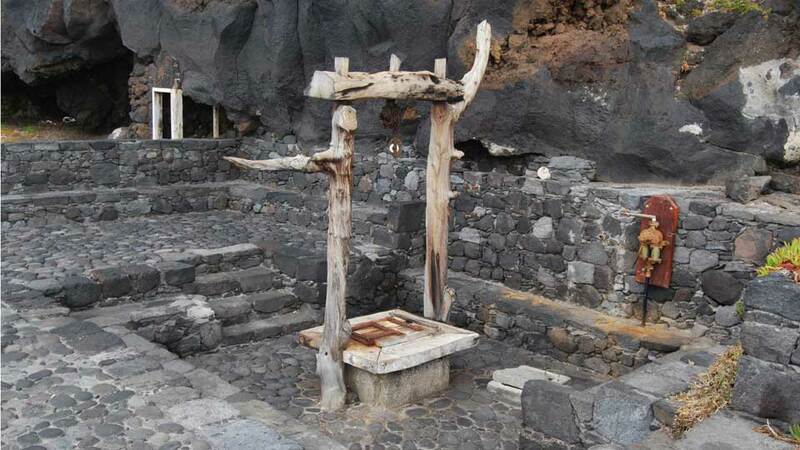 The mirador especially created for and around the well is made of volcanic rocks. It’s an all gray masonry of staircase design with no vibrant colors or embellishments. It may have been made that way to not pull the attention away from the well which serves as its centerpiece. The whole viewing point complements the rugged cliff it stands on. Here, people can witness the glistening azure Atlantic that is calm until its waves crash towards the volcanic isle. They may also marvel at the soaring mountain behind. Or relax to the symphony of waves below and the birds flying overhead. Hotel Balneario Pozo de la Salud is in a very fabulous location. Like the famous Well of Health on its side, the hotel also stands by the cliff. And although it is a relatively small hotel, it looks humongous compared to its neighbors. When tourists arrive at the traditional-looking building, they expect the interiors to match its exterior. The inside, though, is nothing like its facade. In fact, it’s pretty modern and colorful. The whole complex is also equipped with updated facilities and modern amenities. The only hard decision guests have to make is choosing which room view they prefer. Is it the massive mountain or maybe the vast sea that, as a matter of fact, extends all the way to Florida? No matter which room they choose, they can always have the best of both worlds by walking around. The hotel offers a wide array of clinical, aesthetic and relaxation treatments. So tired travelers can unwind and get healthy at the same time. They also have a hot tub, an outdoor pool, children’s playground, and a terrace overlooking the ocean. Whenever guests get hungry or want coffee, the restaurant on-site is ready to serve. They offer a host of traditional Canarian and international dishes. There is also a bar where they can meet other friendly tourists. The Hotel Balneario Pozo de la Salud is the only hotel and restaurant in Sabinosa. So, for tourists who’d like to stay in a different hotel or have a meal elsewhere, it’s best that they hire a car and drive on their own. The island’s public transport system for Sabinosa follows a schedule and are not available every hour. The public transport system of El Hierro services the west side of the island, but only a few times a day. It is advisable that tourists visiting different towns drive on their own. From Valverde, take bus line 3 to Frontera. During regular working days, it departs at 08:00, 10:30, 13:10, 15:30, 18:00, and 21:30. On weekends and holidays — 08:00, 10:30, 13:30, 18:30, and 21:30. Then, from Frontera, take bus lines 4 or 12 to Pozo de la Salud. Bus line 4 departs at 08:30, 11:00, and 15:30 on workdays, and 08:30 and 11:00 on Saturdays. As for bus line 12, its single trip is only at 22:00. It is not necessary for tourists to be interested in water wells for a stopover at Pozo de la Salud. Regardless of what attracts their attention or steers their enthusiasm, a visit to the lovely little well will blow them away. The well that was drilled on the cliff is the perfect vantage point to see incredible panoramas. After learning about its colorful history, take a look around and prepare to fall in love. The shimmering blue Atlantic is expansive and undisturbed. Standing guard over the little town of Sabinosa is the behemoth of a mountain. The visit isn’t only to learn about the story of this part of the island. It is also for the tourists to fully relax and enjoy a vacation that is not only informative but also close to nature.